Mid-Spring 1911 Butler Brothers Wholesale Catalog ad. 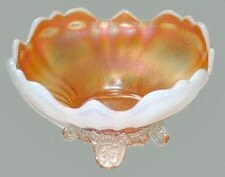 Westmoreland set in Marigold EGYPTIAN IRIDESCENT, as seen in the above Butler Bros. catalog ad. - Height - 3 in. - Width - 5.25 inches. 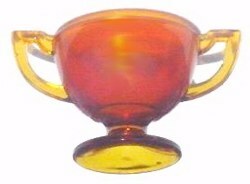 EGYPTIAN IRIDESCENT Sugar in amber base glass. 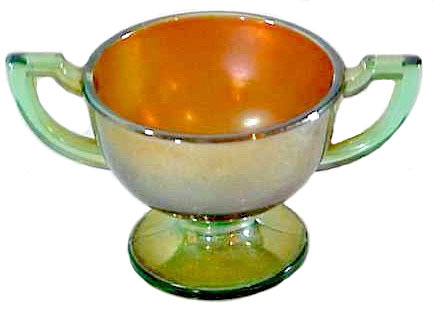 Westmoreland Green Glass with the (gold) interior referred to in the EGYPTIAN IRIDESCENT ad of 1911. Also seen in familiar Aqua. 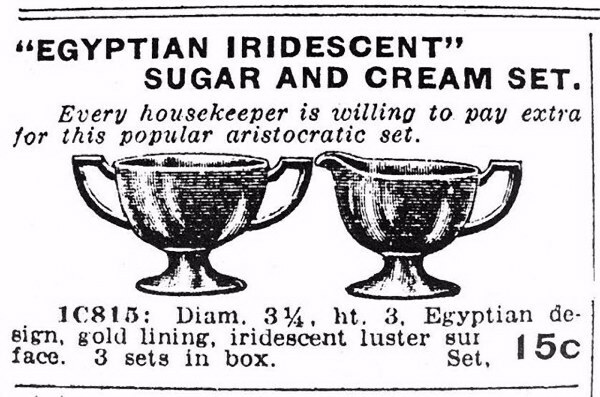 EGYPTIAN LUSTRE: Apparently these were “appropriate for the times”. We display several different colors offered in these sets. 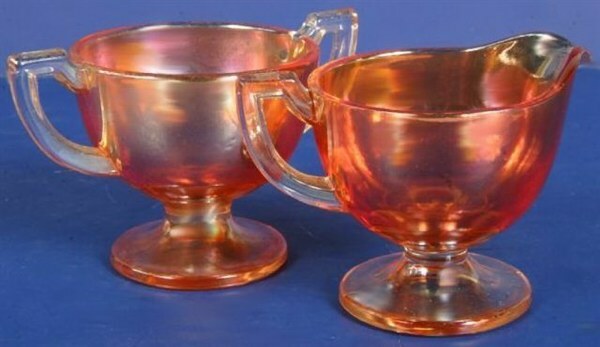 Interpretation of the overall name is: rather than being sprayed on hot glass and returned to the furnace for another firing, such as was required to create Fenton red carnival glass finish, these pieces received a coat of paint placed on cold glass. 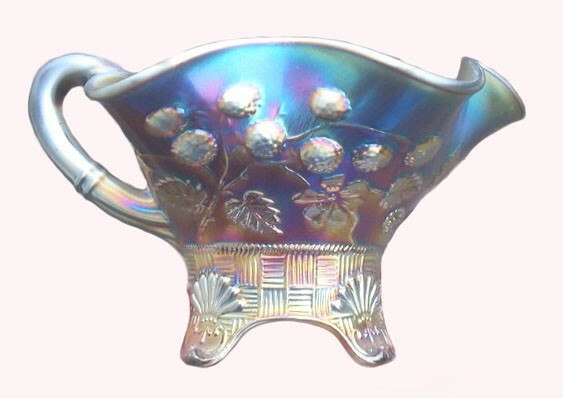 The interior appears to be gold luster, while the outer color is referred to as “iridescent luster” leaving the handles to their original base coloration. Base size on these pieces is about 2 3/8” diameter. The 1911 Butler Bros. ad describes the height and opening widths. Actual sizes differ somewhat. Aqua, amber, amethyst, clear (marigold overlay) and green are known base glass colors. This was one of the very early iridized efforts by Westmoreland. 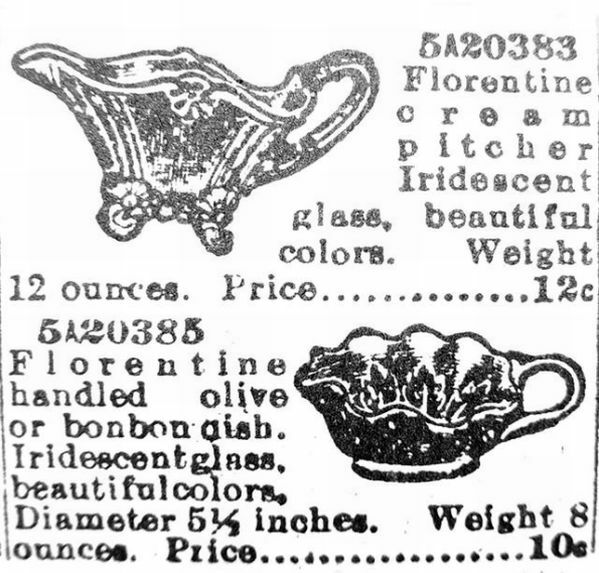 Ads for this same design are found as early as 1907. 3.25 in. tall x 3 in. diam. excluding handles. FLUTE: Clambroth is a virtual unknown color in this design of breakfast set from Imperial, but seeing is believing! Purple is more in line with what we might expect from this company who could not be surpassed when it came to “perfect purple”. Marigold sets are also a known commodity. Creamer to a Breakfast Set. 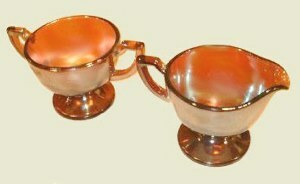 FAN: According to the Smyth ad, a piece of Dugan which many times is referred to as a “gravy boat”, was marketed as a creamer, so it follows that the shape we show with that creamer, should be called an “open sugar”; not a sauce dish, comprising quite an “elegant” breakfast set (one of the prettiest Victorian era sets available, actually!) 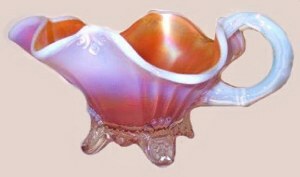 The set is found only in peach opalescent and purple. Sometime around 1911-1912 the FAN moulds were re-tooled and became the DAHLIA pattern. APPLE PANELS: Found only in marigold, this small set attributed to Fenton manufacture, is one of the many sorely overlooked bright spots among CG patterns! The hobstars and apples combine within the panels to make a striking design, and quite a departure from the many other combinations. The lovely pattern has not been discovered in any other shape. It has been an unsolved mystery in my thinking over many years, as to the reason such scarce patterns as this are not more valuable to collectors than the hundreds of Peacocks patterns and Good Lucks?????? This little gem of a set can be purchased for under $100, whenever it does surface, and the mold work is just as bold and venturesome as any of the others which receive rave reviews. Go Figure! Any reasonable answer will be given consideration. Someone once remarked that, for the most part, those patterns which avail themselves to the buying public with regularity are foremost in the minds and desires. Since a great many “collectors” do not spend ample time learning about patterns/manufacturers, they make the mistaken assumption that something such as an Apple Panels set is “irrelevant”. Somewhat “depression-like” in its appearance, we have no verification as to the production period in which it was made. RASPBERRY Occasional Piece: Called a gravy boat by some, an advertising statement of the period confirms its intended use to be a breakfast creamer. It was offered as a “premium” piece by distributors and wholesalers selling a specified quantity of other products. Raspberry water sets and milk pitchers were also offered on free, “premium” basis when minimum orders of other products were forthcoming. This period of advertising was circa 1911-1912. These occasional pieces are known only in four colors: marigold, amethyst, green and teal. These pieces are available in fewer numbers than the water sets, with teal being far and away the rarest. Most carry the Northwood trademark. Daniel purposed in his heart that he would not defile himself. Consistency of character is what gains the respect of others. Christians who do not live what they say they believe are looked upon by the world with disdain. We should remain true to our convictions. If you're living for Christ you may lose some friends, but you won't lose their respect.